This past month, the Alliance participated in two important conferences which brought together educators, social workers, advocates and youth to share best practices for improving the education outcomes of children and youth in foster care. The 2016 California Foster Youth Education Summit took place on April 11th and 12th in Sacramento. This year’s summit, put on by the California Foster Youth Education Task Force which is co-chaired by Alliance Senior Policy Attorney Molly Dunn, focused on partnership, practice and capacity building to move implementation of the state’s sweeping education reform effort, known as the Local Control Funding Formula, forward for students in foster care. With 820 attendees from 52 counties throughout California, this was the biggest summit yet. The keynote address was delivered by Chadwick Sapenter, a former foster youth turned entrepreneur who shared how meaningful connections with, and words of encouragement from, adults in his life helped him to persevere and find his life’s purpose. Mr. Sapenter also conducted two workshops for the 140 current and former foster youth who attended the summit. Thirty-eight other workshops were offered at the summit, nine of which were conducted by members of the Alliance team. Jill Rowland, the Alliance’s Education Program Director, gave several workshops that highlighted how the Foster Youth Education Toolkit can be used by school districts to successfully implement LCFF. Danielle Tenner, Staff Attorney, was a panelist in a session on supporting LCFF implementation through collaborative technical assistance. Alliance Social Worker Barbara Facher presented Parenting Foster Youth and College: Challenges and Opportunities in conjunction with Public Council social worker Mara Ziegler. Staff Attorney Alaina Moonves Leb did a Know Your Rights session and also spoke on another panel about the Alliance’s partnership UCLA and First Star to prepare foster youth for college. 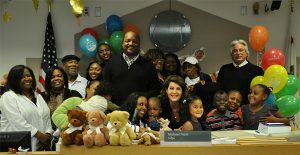 Finally, Molly Dunn offered a session, Early Learning and Development for Foster Children: Leveraging LCFF to Bridge the Child Care Gap, during which she spoke about a budget request currently before the legislature that would improve access to subsidized child care for young foster children. Finally, the summit concluded with a lobby day at the State Capitol. Eighty youth and supportive adults met with over 30 members of the legislature seeking their aye vote on two bills that will help foster youth complete college degrees. 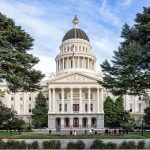 AB 2506 (Thurmond) would make financial assistance for foster youth, the Chafee Education and Training Vouchers, available to all foster youth who meet the eligibility requirements of the grant. Currently, one in four youth who apply do not receive a grant due to lack of funds. SB 906 (Beall) would preserve priority registration for foster youth at California’s community colleges, state universities, and universities. A group of youth also had an opportunity to testify before the Assembly Higher Education Committee in support of AB 2506. Members of the Alliance staff also attended and contributed to Piecing It Together: Educating Students Experiencing Homelessness or in Foster Care. Held on May 5th at The California Endowment, this regional symposium for southern California was put on by six county offices of education. Two Alliance clients and Opportunity Youth Collaborative Young Leaders, Maria and Denisse, spoke as part of the youth panel. Alliance staff presented in multiple sessions. Senior Policy Attorney Molly Dunn led a workshop, Understanding the Changing Landscape of the Child Welfare System in California and the Implications for Schools. Staff Attorney Amy Mejia was on a panel discussion titled Supporting Parents and Caregivers of Young Children During the Early Years. Education Program Director Jill Rowland and Staff Attorney Danielle Tenner presented Education Laws Designed to Support Foster, Probation, and Homeless Youth. 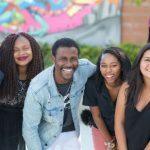 This entry was posted in Around The Alliance, Education, Programs and tagged California Foster Youth Education Summit, Opportunity Youth Collaborative, The California Endowment. Bookmark the permalink. ← Governor Brown’s May Revised Budget Proposes Home-Based Family Care Rate for ALL Families – Including Kin!